February | 2015 | Eltham District Historical Society Inc. The history of the land has not been fully researched. This article is based partly on Society records and partly on the recollections of Doug Orford and Russell Yeoman. The land in question is Crown Allotment 15, Section 5, Parish of Nillumbik (CA15). It is a square allotment of 158 acres or approximately a quarter of a square mile. It lies just beyond the eastern end of Pitt Street and extends from Eucalyptus Road to Reynolds Road. Eucalyptus Road is a straight north-south road with its northern end at the north west corner of CA15. Until the end of the 1970s this road was an un-named Government road and was largely not open to traffic. With residential development in the 1970s the road was constructed and the council allocated the name obviously in recognition of the predominant species of the local bushland. CA15 was purchased from the Crown by George D’Arley Boursinquot, a prominent Melbourne printer, on 28th October 1852. The history of subsequent ownership has not been researched but it seems that the land remained as unused bushland for very many years. The topography of CA15 is generally steep, sloping up to a hill near the centre of the land. In the 1920s CA15 was subdivided into 48 lots that could be described as small rural properties or large residential lots. A typical lot size was one hectare or 2.5 acres. The subdivision created two roads, Nyora Road and Diosma Road, each following an irregular alignment between Eucalyptus and Reynolds Roads. However the lots were not sold off separately nor were the roads constructed. The land effectively remained as one parcel for many further years. In the 1940s CA15 was owned by a Frank Stokes who built a house at the corner of Nyora Road and Eucalyptus Road and established an orchard on the western part of the land. 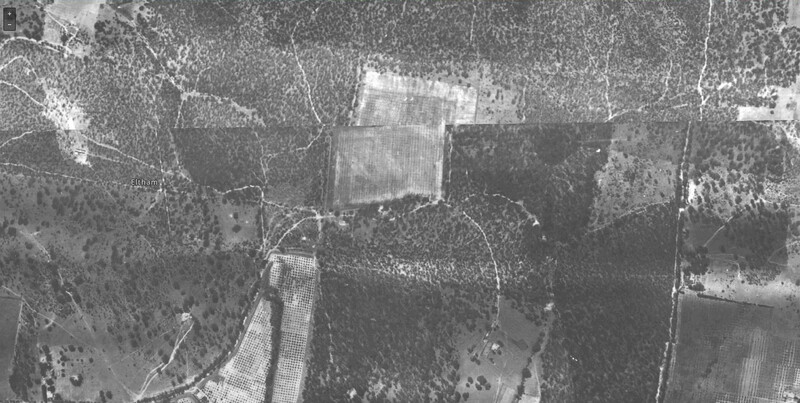 Aerial photographs from 1958 clearly show the orchard with most of the site remaining as bushland. In the early 1950s the Melbourne and Metropolitan Board of Works acquired land on the hilltop for a high level service reservoir to augment Eltham’s water supply. The project also included pipe tracks for the necessary water mains. The reservoir has now been superseded by higher level water tanks east of Reynolds Road and its former site is now a public reserve. In the early 1960s an easement was acquired through the eastern part of the land for a major electricity transmission line that augmented supply from the La Trobe Valley to Melbourne. Later the easement was widened and a second transmission line was constructed. In 1971 Melbourne Metropolitan Planning Scheme amendments adopted Nyora Road as the boundary between a residential zone to the north and a rural zone to the south. This determined the future development of the land. In the 1970s land between Nyora and Diosma Roads and west of the electricity easement was sold and subdivided into residential lots and known as the Stokes Orchard Estate. New streets were created and most were named after trees, although one, Stokes Place, commemorates the former owners. There were difficulties with sewerage for the land immediately south of Diosma Road and so the conventional residential lots were abandoned in favour of larger lots. These included a low density group housing development by the Graves family. The Stokes family were associated with the Eltham Christian Church. In the 1970s this church had met in temporary premises in Eltham. 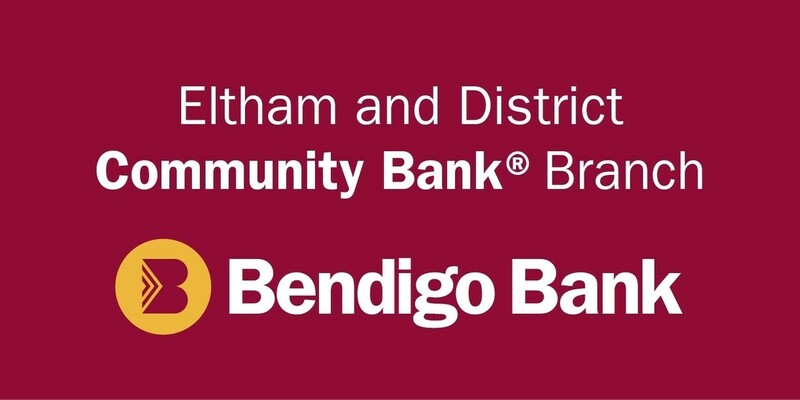 Lots of the original 1920s subdivision remained south of Nyora Road and a number of these lots were utilized for the Eltham Christian School, which was established by the Eltham Christian Church in 1981. The school operated on this site until 2000. The premises are now used by the Nillumbik Community Church. By the mid 1980s the whole of CA15 had been developed for residential and school purposes, except for the sections north of Diosma Road and between the transmission lines and Reynolds Road. Sewerage issues had been resolved for the section north of Diosma Road and in 1987 it was in the process of being subdivided into residential lots. The development coincided with the discovery of colonies of the rare and endangered Eltham Copper Butterfly on the site. This resulted in a community and political campaign to save the butterfly habitat. 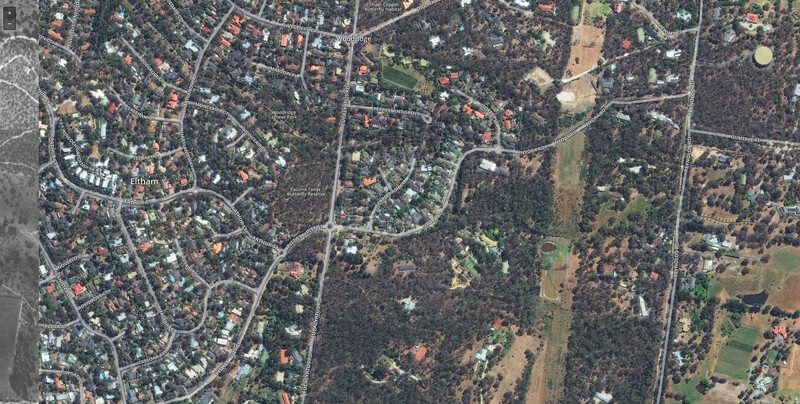 With the co-operation of the land developer the subdivision was altered to create two bushland reserves in the critical butterfly habitat areas. In the late 1980s the State Government was investigating options for establishing a metropolitan ring road link between Diamond Creek and Ringwood. The chosen route was adjacent to Reynolds Road and so this created a freeze on development of CA15 between Reynolds Road and the electricity easement. The ring road proposal was eventually abandoned and this part of the land was subdivided into low density residential lots. Diosma Road has been discontinued at the electricity easement and the eastern part incorporated into View Mount Court with access from Reynolds Road. The whole of CA15 has now been developed for residential or associated purposes, ranging from conventional density to quite low density south of Nyora Road. The butterfly reserves comprise significant areas of remnant bushland. Linear reserves through the estate link with central Eltham via the Woodridge linear reserve and with Research along the electricity easement. CA15 as it exists today has a complicated history of rural use, Government acquisition, urban development and community action. For those who love before and after photos, and who doesn’t, a fascinating new site has been launched called Melbourne 1945. 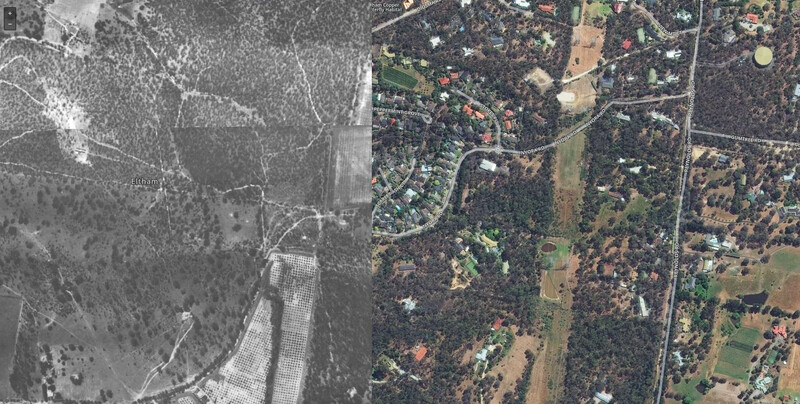 Based on aerial photographs commissioned by the Department of Crown Lands and Survey, and conducted by Adastra Airways, a slider enables the viewer to change the view from 1945 to current day. The 1945 survey covers the Eltham district extending east to Research and north to St Helena. We are all connected in some way to an address, be it a street, road, court, crescent, lane or perhaps it is known by another name. Have you ever thought about how that name came about? The origin of road or street names is not always clear-cut. Generally in Victoria the first roads were established through the survey and sale of Crown land. Many of these were simply identified as Government roads, which is not an actual name. In the 1850s the need for practical and legal access became apparent in the Eltham area and the Government acquired roads through privately owned land. By doing this they created new roads that were often more direct or had more practical alignments. Later, local councils were also able to acquire roads. Names for these roads often came about by popular usage, like Main Road for instance. Sometimes the name was formalised by Council declaration, or in other cases the common name just came to be accepted as the official name. As privately owned land was subdivided the streets that were created eventually became public roads. Now, new plans of subdivision show the names of streets, although on many of the older subdivision plans you will see them simply identified as “road”. Often the names of streets are selected by the subdivider, perhaps named after families, local plants and local identities or are descriptive, such as Hillcrest Road or Skyline Road. A council could also decide new names, possibly in consultation with the local community or historical group. In later articles we will look at the origin of the names of some particular roads and local streets, perhaps even the one where you live or that you regularly use.